This one is dedicated to long-time reader Kit, who will be celebrating a birthday this weekend. Happy birthday Kit! I’m at San Diego Comic-Con today so I’ll be tweeting about it and taking pictures. Looks like it’s going to be a fun day! Oh, and the arm of the guy in the cantina in A New Hope..”I don’t like you either” guy. Poor Max, he wouldn’t play anymore! Let’s give ’em all a big hand!! waiter there is a finger in my soup. How about other great pictures about the disenfranchised limb one of the best that comes to mind is Henry Fonda’s arm in Sometimes a Great Notion first removed by chain saw accident, then frozen, finally placed on board the log tug with middle finger waving, classic. Then there is seven heads and a duffle bag. Only five finger? I’m sure George Lucas will “fix” that in the next re-re-re-release. 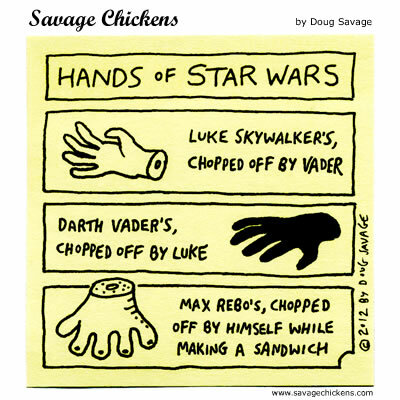 Dookus hands chopped off by Vader and probably about 10 more I can’t think of!